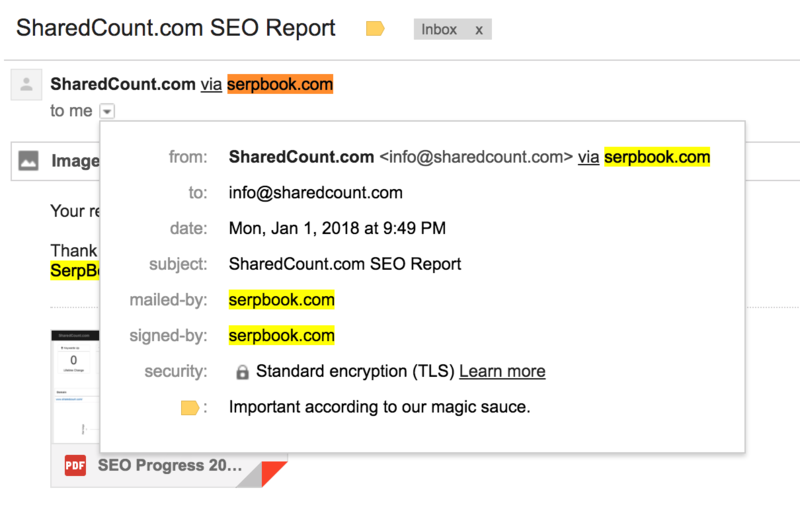 Without verification, reports will be sent out through your email domain, via serpbook.com. 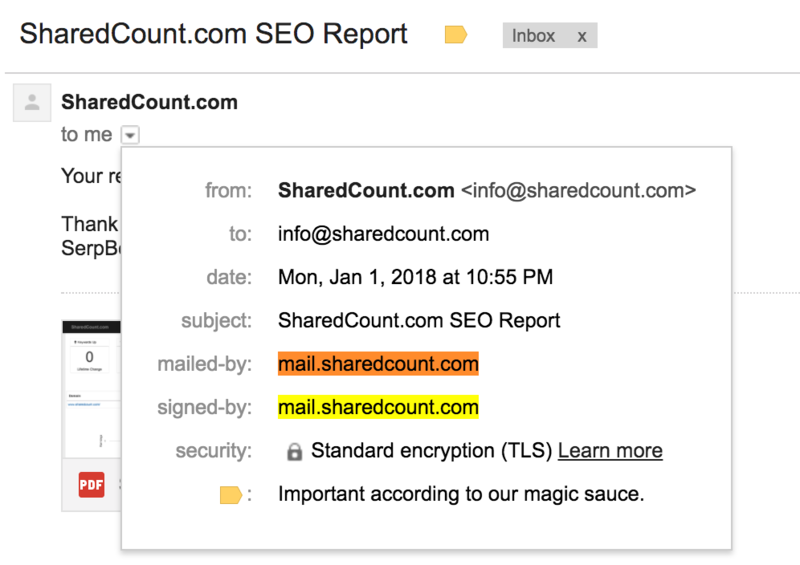 Mail will always be 'mailed-by' and 'signed-by' serpbook.com. This can be fixed by adding the correct SPF records. Verifying the domain will allow you to send emails as if you had sent them 100% from your own servers. 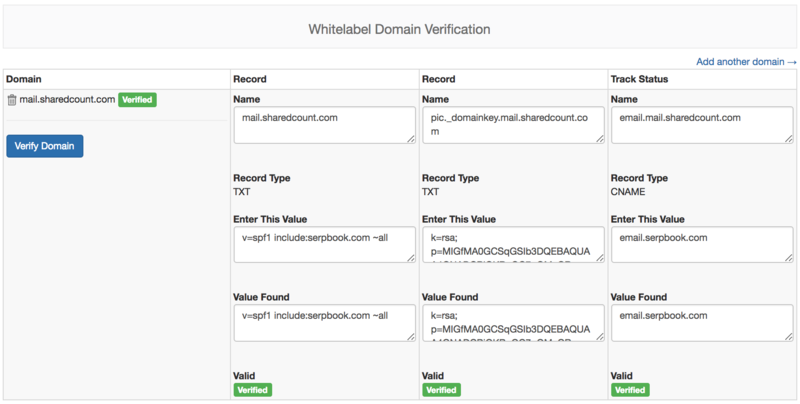 Domains can be verified within the reports section by clicking on "Whitelabel Domain Verification" on the top right. Add in a domain, and update the correct TXT & CNAME values. Your records will automatically be verified once an hour, or you can manually update them by clicking on "Verify Domain". Note: if you are having issues, be sure to have include:serpbook.com as the first domain listed. I put "k1._domainkey.yourdomain.com" into the record as the host and it was denied. Please enter "k1._domainkey" as your host, rather then "k1._domainkey.yourdomain.com". It's not letting me put "yourdomain.com" into the record as the host. If you are trying to send mail from the root domain, you would typically put a "@" as the host value, rather than the domain name. Do I need to add in the CNAME? The CNAME record is optional. It is only needed if you wish to track the status of your email (ie. opens, clicks, deliveries, bounces). You can set the value to "email.serpbook.com" to enable it, or leave it alone to ignore it. I've updated all the records, but it's not verifying. Please give it some time 10-20 minutes and try verifying again, if the issue persists, you can try to trace your TXT records and figure out what is going on. I have multiple v=spf1 records, and I've included SerpBook, but it's not verifying. Please ensure "include:serpbook.com" is listed as the first domain name in that TXT record and try again. Please double check ensure you don't have multiple entries of TXT records, merge them into one if necessary.